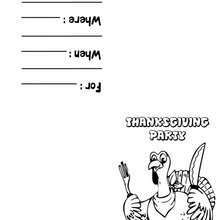 Will you be hosting a Thanksgiving dinner this year? 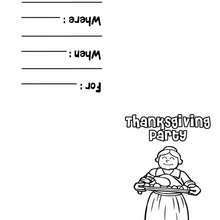 The printable Thanksgiving cards and party invitation section has a bountiful supply of invitations to send to your special guests. 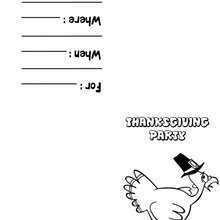 The Thanksgiving invitations are a great activity for kids to feel involved with the Thanksgiving holiday festivities. Choose from the many online printable themes: turkey, pumpkin, Indian, dinner turkeys, cornucopia, Pilgrim and print to have the kids color with beautiful Autumn colors. 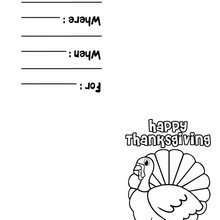 You can even color the Thanksgiving invitations online and print to give to family and friends. 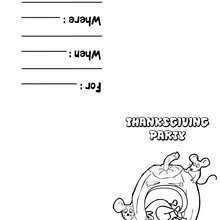 The fun printable Thanksgiving invitations are also a great way to have your children invite their friends over for a playdate, sleepover or birthday party. Keep your kids entertained over the Thanksgiving holiday with all the Hellokids Thanksgiving ideas, crafts and activities. In the Thanksgiving section you can learn How to draw Thanksgiving characters, play with the online Thanksgiving puzzle games, read Thanksgiving poems, make a Thanksgiving craft, Color printable Thanksgiving coloring pages to decorate your room, learn about the history of Thanksgiving, make your family and friends laugh by reciting Thanksgiving jokes and much more.